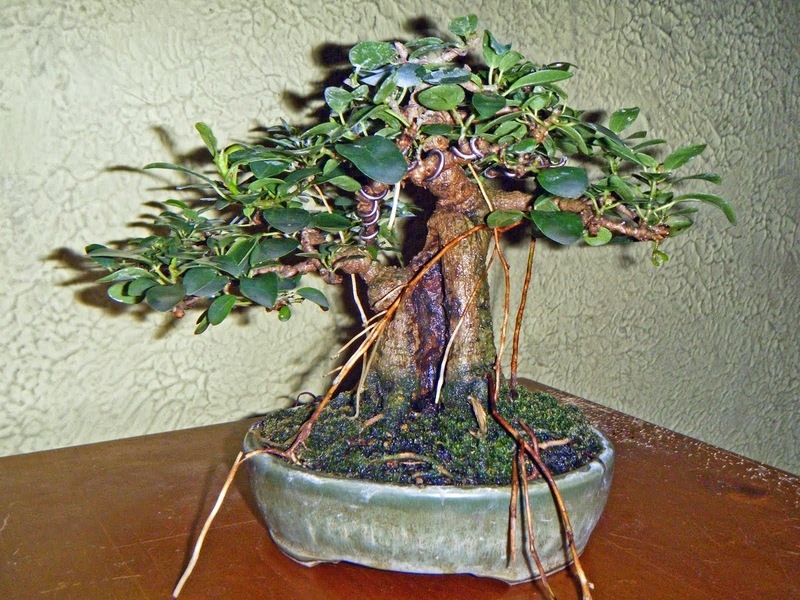 Bonsai in Hoosierland: The Yew: Bonsai for Everyone. In 1906, a London bookbinder named Joseph Dent began publishing "Everyman's Library." His purpose was to make fine literature available to "every man" in a reasonably priced edition. Everyman® is still in business today. Yew bonsai at the ABS Symposium in St. Louis, 2004. Readily available in much of the USA and Europe in general-purpose nurseries. At the same time, there are a few cautions about yews. One in particular must be taken into account. Yews are poisonous to humans and most of our domesticated mammals. If you have a small child in the house, consider waiting until he or she is old enough to understand the danger. Yews are not for hot climates. They grow best in the world's temperate-to-cold zones. Yews don't tolerate soggy soil. Poor drainage will kill them. The branches should not be worked in winter: the cambium can separate from the sapwood and the whole branch can die. Mankind has a long association with the yew. Yew wood is hard and durable, so until the development of plastics it was widely used for items that took a lot of wear. It is also strong and flexible, ideal for bows. The famous "Iceman," whose mummy was found in 1991 after 5,000 years in an Italian glacier, was carrying an unfinished bow made of yew. 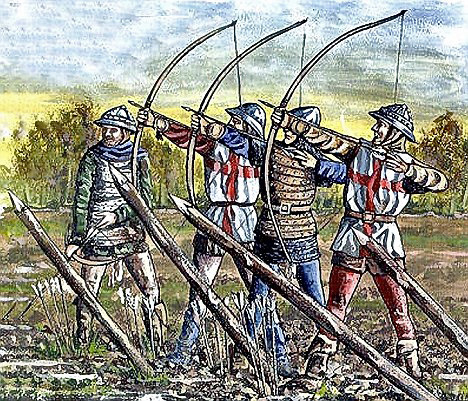 More than 4500 years after his death, longbows, made of yew more often than any other wood, played a decisive part in the English victories at Crécy (1346) and Agincourt (1415.) Julius Caesar recorded that the Gaulish chieftain Catuvolcus poisoned himself with yew berries rather than live under Roman rule. In more recent times, tho, with the development of gunpowder and later of plastics, yews have come to be used for landscaping but not much else. The yew is an evergreen conifer. 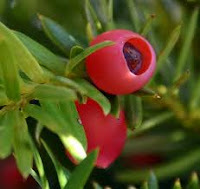 Its "berry" (or aril) is in fact a modified cone, closer in structure to a pine cone than a grape. Unlike the majority of seed-bearing plants, yews are dioecious, with individual plants being either male or female. Fortingall yew, Scotland. 2,000-5,000 years old. Yews are slow-growing and long-lived. The oldest yew that I have personally seen is the Glencormac yew (click here.) At 2,000 years old, it is still far from the oldest yew known. 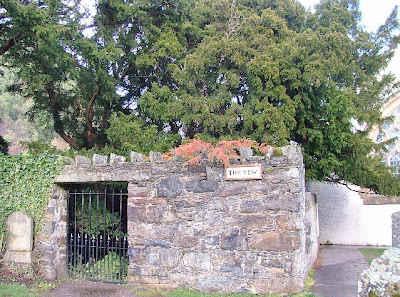 That honor goes to either the Fortingall yew, in Scotland, or the Llangernyw yew in Wales. Determining the precise age of an older yew is often impossible because, while yew wood is quite rot-resistant, after several millenia even it starts to break down. Botanists are then only able to establish an age range. Llangernyw yew, Wales. 4,000-5,000 years old. the "Anglojap" hybrid, Taxus x media, which happily combines the greater vigor of T. baccata with the greater cold resistance of T. cuspidata. There are dozens of T. x media cultivars, and most of the yews sold in general-purpose nurseries in the USA belong to one or another. 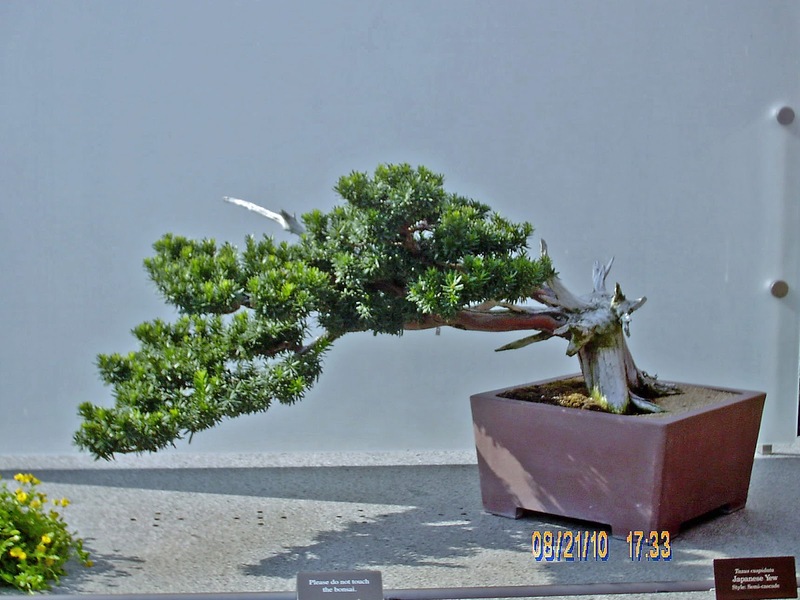 When selecting a hybrid yew for bonsai, check its cultivar's characteristics. 'Hicksii,' for example, has a strongly upright growth habit, which you would be fighting constantly; I would pass it up. 'Densiformis' breaks new buds all over the place, and 'Dark Green Spreader' is just that; I like them both. Some cultivars are female; you might like the bright red arils in autumn. Yew arils; one seed each. Like junipers and arborvitae but in contrast to pines and spruces, yews sprout new branches at random rather than in whorls. 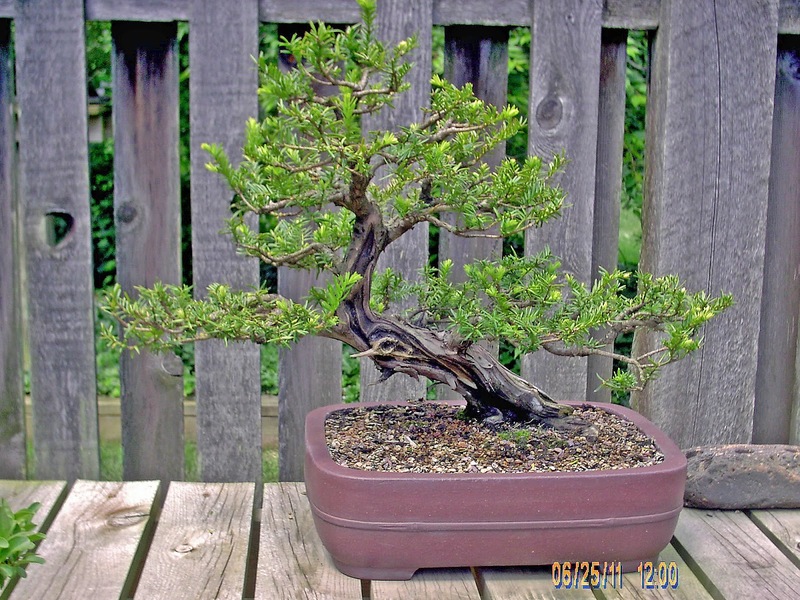 A nice thing for the bonsaiist is that such "irregular-branching" conifers also are able to break new buds on wood as much as 30 years old. Another difference between yews and pines is in the strength of their wood: yew wood is significantly stronger. Consequently, as a yew matures, its primary branches are not as likely to droop as those of a pine or spruce. The branch configuration of a yew, in fact, can often look more like a maple's or a fig's, than a pine's. 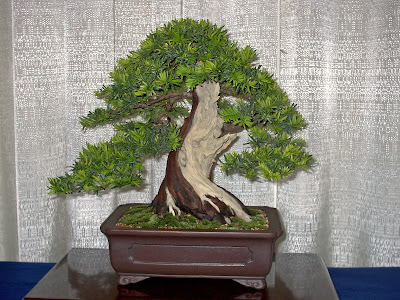 This means that, while a yew can certainly be styled in the classic coniferous styles, the artist doesn't need to be limited to those. A couple of decades ago, bonsai artists in the southern USA developed a new style variation, called "flat-topped," for their bald cypress. Basically a modified broom, it reflects quite accurately the natural look of a bald cypress in the wild. It seems to me that a "yew style" should be possible: a form that reflects the natural look of an old, enduring yew in the wild. This idea is a new one to me, but I hope to be able to contribute to its development. 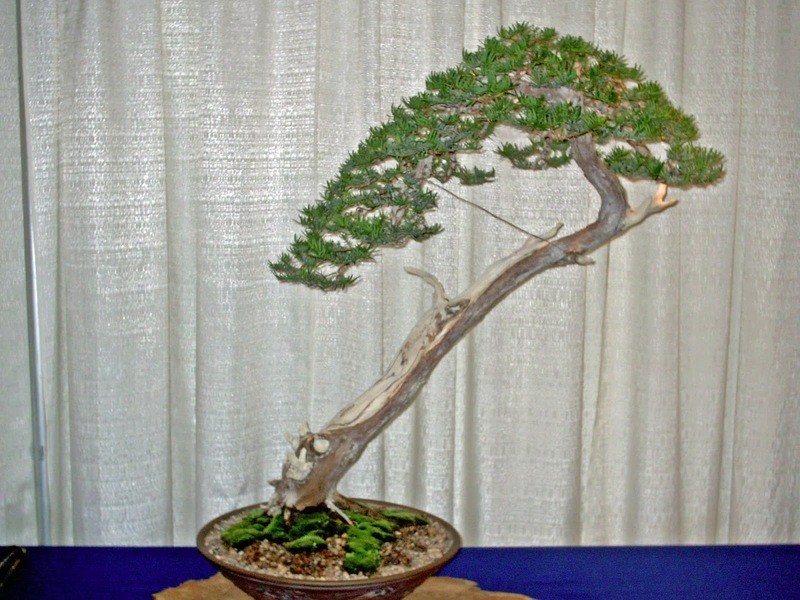 Another yew bonsai at ABS '04 in St. Louis. Owner, Sara Rayner. Personal collection of Jack Wikle; Jack Wikle, artist. -- Steve Moore; April 16, 2012.